CONSTRUCTION sector revenue dropped by a staggering 70 per cent since 2007; the year it reached €2 billion, according to Michalis Zavos, Vice-President of the Cyprus Land and Building Developers Association. Zavos was speaking at the 7th Land and Building Development Conference in Nicosia yesterday, which his Association had jointly organised with the Royal Institution of Chartered Surveyors (RICS). The conference’s target was to inform all interested parties of the real estate market’s current situation and was also attended by Finance Minister Kikis Kazamias. “It is no secret that the construction sector has been hit hard by the continuing global economic crisis, with an ever-crippling demand for property showing no signs of recovery” said Kazamias. “It also true that in 2007-2008 there was an excessive price increase in real estate due to high levels of demand; so it does seem that the property sector is now undergoing a period of crisis and much needed ‘correction'” he added. Zavos warned that the sector’s future depended not only on the global economy’s rate of recovery, but perhaps more importantly on the sector’s ability to address the various challenges it faces. “We have presented the Finance Ministry and all political parties with several suggestions targeting the decrease of property prices, in order to help Cypriot consumers, and especially young couples to acquire properties” he said. “This would trigger an influx of new capital from Cypriots and foreign investors” he said. The Association is suggesting the immediate removal of property transfer charges in cases where VAT is paid, and the adoption of an urban planning amnesty on investment for repatriated capital; provided it is then invested in the local property market. Other suggestions include the modernisation of the legislation concerning International Trusts, so as to model other European countries, with the hope that this would subsequently encourage investment in the Cypriot real estate market. Another proposal would provide the deduction of real estate development loans from the same value used to calculate the corresponding property tax. The Association also stressed the importance of providing specialised incentives for new major developments such as marinas and proposed a twenty percent increase on the building coefficient for routine projects starting in 2012. Kazamias vowed to push forward the adoption of several of these measures in order to stimulate the sector and pledged that a thorough study would be conducted to evaluate taxation of property on the whole. “Through its 2009 fiscal policy, the state took measures to help this sector and although the financial barriers for aiding the economy are still restricted, we vow to do all we can to help the sector” he concluded. What good will it do to reduce the price of your property without a Legal Title Deed to enable you to sell it? If you go through the process of breaking your contract with your Developer and paying all the taxes & fees, you’ll end up owing money to the Cypriot Government, especially if you have not owned the property for the requisite number of years. Lowering prices to sell a property where you do have a Legal Title Deed is obviously up to each individual’s circumstances. @Costas Apacket, Andrew and AndyP nailed it. I fear we are just muting these factors amongst ourselves however. Buyers having to pay for developer building “errors”. Lack of legal protection when it all goes wrong. These learned people appear to have overlooked the one huge problem that home buyers face when buying a new build property. They withhold your Title Deeds. Quite simply, give us our Title Deeds, when we pay for our homes. Don`t give us “tools” to fight the system. Give us what we pay for. Give us honest lawyers. 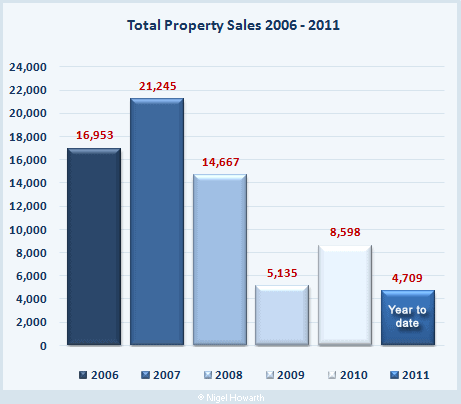 Then watch the property market grow. Just being straight & honest with people and letting property purchasers actually own their fully paid for homes would be a good start.